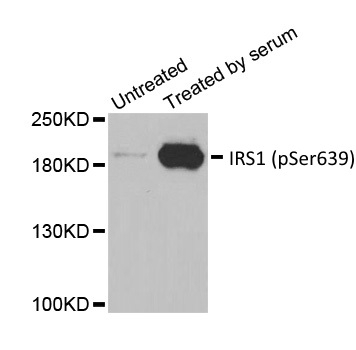 Rabbit anti IRS1 (pSer639) antibody recognizes insulin receptor substrate 1 (IRS1), when phosphorylated at serine 639. IRS proteins are substrates of the insulin receptor tyrosine kinase and play a key role in insulin signaling. IRS1 is phosphorylated at serine 639 by mTOR (Tzatsos 2009). Antiserum to IRS1 (pSer639) was raised by repeated immunization of rabbits with highly purified antigen. Purified IgG was prepared from whole serum by affinity chromatography. Tzatsos, A. (2009) Raptor binds the SAIN (Shc and IRS-1 NPXY binding) domain of insulin receptor substrate-1 (IRS-1) and regulates the phosphorylation of IRS-1 at Ser-636/639 by mTOR. J Biol Chem. 284 (34): 22525-34.